It’s that time of year when political ads, calls, debates, mailings, and commentaries overload our senses along with fall colors. The upcoming elections in the United States are causing almost everyone’s stress levels to climb. Stress happens even when we don’t realize it and impacts our memories more than we think. Everyday activities like simply watching the news, conversing in a coffee shop, or dining with friends can be a new source of stress. When routines are disrupted, change is forced upon us or uncertain futures loom, our stress meters creep into overload and even simple things escape our memory. Stress can come from any source, but the symptoms are the same. Focusing is lost, scatterbrain develops, sleep is erratic, eating disrupted, and normal relationships feel strained. Stress causes many physical symptoms and even contributes to diseases, but its impact on our memory can also be quite impairing. Is your stress meter needle inching into the red zone with the upcoming elections, holidays or other stressors looming? Feeling scattered, with even less of a memory than you used to have? You’re not alone. Many slip into depressive moods, fight more physical ailments than usual, and can’t make decisions well as the holidays approach. Stress contributes to all of this, yet many don’t always see stress as their source. Elections, holidays, and other stressors will come and go and it’s up to each of us to manage how we deal with the effects of them. The first step like most things is to acknowledge if there’s an issue. Some people thrive on the increased activities and stress surrounding big events. Others struggle and if so, the next step is crucial. Understanding how stress affects each of us is a great learning tool for our emotional and memory wellness. We can’t always change stress or its sources, but we can always manage our reactions. Our overall attitude matters a lot here and we’ll discuss that another day, but for now let’s focus on our stress awareness and management. If we don’t manage stress well, physical and memory symptoms will develop. So let’s be aware of our typical reactions and then manage them in a healthy way to mitigate any potential fallout. Exercise. This releases endorphins improving mood, sleep and increases blood flow to help our memory. Win, win, win! Take a mental or physical break. If able, physically get away if only for a few moments from any stress inducing person or situation. Some fresh air and a change of venue can do wonders for perspective. If this isn’t possible, take a mini respite in your own mind for a few seconds or minutes. Breathe in deeply a few times and draw in some fresh oxygen and perspective. Talk it over. Whether it’s with a close friend, family member, an impartial professional or higher power, talking through a stressful situation with another can often help us find a solution or at least the next step. Change it up. Often when faced with a stressful situation, we become creatures of habit. Sometimes, these habits can perpetuate the stress. Changing something, anything can often create momentum to move us in a new and less stressful direction. Stress sneaks up on us or comes with full force. It stems from both unsettling and happy events and impacts our memory more than we imagine. Being diligently aware of its symptoms in ourselves and others will lead to many more memorable and less stress filled moments. So let’s be alert, manage stress and make more memories! “I’m worried about (fill in the blank of a loved one), their memory isn’t what it should be.” I hear this often and did again the other day. Many suffer more forgetful moments with age. For those of us in middle age, it can be due to increased stress or doing too many things at once to focus and remember well. In our older years, many see forgetfulness as a normal sign of aging and lesser abilities overall. While there is a bit of truth to that, we should still be able to recall what we want, when we want, even as we get older. My friend said her loved one was less social and didn’t engage in many mentally challenging things any more. These comments were a red flag to me. Often those experiencing memory loss tend to withdraw from socialization because it’s more difficult. They don’t like doing mentally stimulating activities because they’re more challenging than in the past. It’s not fun being in those situations! But in these situations it’s important to stay engaged and also speak to your physician. Memory loss can be caused by many things including stress, depression, medication interactions, or a physical issue. If these are all ruled out, then a neurological assessment should be done to see if there’s another reason for the memory issues. A complete workup can differentiate why memory issues are occurring and help with treatment. But one thing that will help us all is mental stimulation. Ideally, we all want to challenge ourselves daily to the point of it being a mental workout, but not stressful. How we do this varies depending on the individual, time of day, circumstances etc. The important thing is to just do it! Do what you love by pushing yourself to learn something new or by doing it differently. My friend who was concerned about her loved one said he liked to read, so I suggested reading aloud. It activates more of the brain than reading silently. Leisure activities may have to adjust too. If one card game causes stress, try a different one that challenges but doesn’t frustrate. Or simply do challenging things for shorter time periods to give your brain a break. Another way to push ourselves mentally is to do it with friends or family. Play games together, go to cultural events, learn new things, or travel to new places. When we do things with others we stimulate our brains differently than we can by ourselves. It’s always more fun to learn new things with others! Aging can create its own challenges and if memory loss creeps in, the difficulties mount. It’s important to acknowledge and seek assistance as soon as memory issues are noted. The earlier strategies are put in place, the better memory loss can be managed. Seek professional help and therapies to assist. Being proactive with mental fitness, being with others and learning memory strategies can improve and lengthen quality of life. 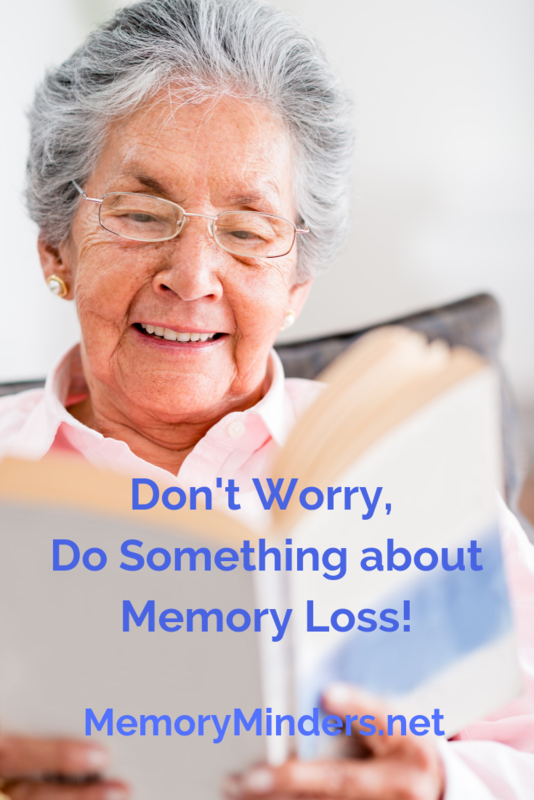 Don’t worry about memory loss, do something about it! It was a beautiful sunny, September morning and I just happened to have the news on TV. A plane had hit the World Trade Center in an apparent accident. I continued my routine and went for a walk with my young son in the stroller. But soon people were coming out of stores asking if I had heard the news-there was another plane. Probably not since Pearl Harbor had our country ever felt so violated, so in shock that our idyllic existence could be interrupted or impacted. We were glued to the TV the rest of the day, cancelled plans and our world has never been quite the same. We not only lost thousands of souls that day, but our naivety too. Its impact and memory still have influence today and will for years to come. The events of 9/11/2001 have forever changed our lives in more ways than we can imagine. It isn’t just about the loved ones lost and brave souls who rushed in to help, but about the impact on our country and world. It is a seminal moment for all of us who lived through that day, just as Pearl Harbor or JFK’s assassination was for past generations. Emotions and memories are intricately entwined. The brain processes memory and emotion in close proximity and any emotional memory will be remembered more strongly because of this. 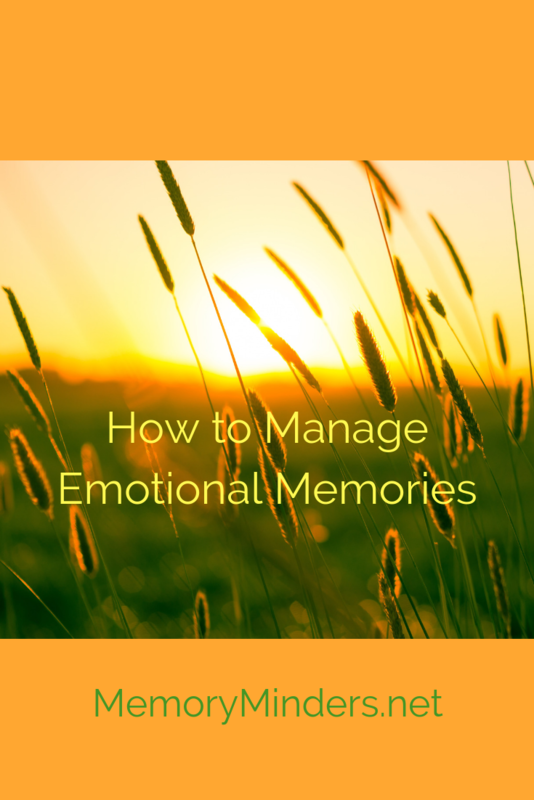 Think about your most emotional memories-highlights and low moments. I bet you can recall vivid details about each of them and even their subsequent impact on your life. So when something as big as 9/11 happens, it stays with us. But so do the everyday emotional events that only we know: the sickness of a loved one, a nagging worry, a persistent health issue, chronic stress from our job etc. It may not be visible or understood by anyone other than us, but it’s there nonetheless. The concerns, worries, emotions and stress bubbling under the surface of our existence interfere with our memory. Our brains create strong memories in some areas but can also cause us to be seemingly forgetful in others. It can even lead to depression or worsening physical issues. When life’s circumstances jolt our world, we need to realize the impact on our memories. We can’t always control what is happening around us, but we can control how we deal with it. Choosing healthy reactions, enacting stress management strategies and understanding the toll these situations create are the first steps in dealing with them. But even when we do all this, things can still seem overwhelming. If and when life seems to be too much to bear, professional counseling or management may be needed and should not be looked upon as failure. Everyone needs a helping hand at some point. Recognizing this in ourselves and others can help us all deal with the changes life sometimes throws at us. And in the process, it may even help us retain and create new and better memories. Winds are shifting, leaves are beginning to fall and school bells are ringing. These telltale end of summer signs may make us feel sad about the end of one season and the beginning of another. But if you’ve participated in our #SummerToRemember series, it’s my hope you have plenty of memories to draw upon as autumn approaches. Mine sure has been a summer to remember with monumental birthdays, milestone events and small moments to cherish. Whether yours was full of big moments or a series of small, all of them are worth savoring. We began this series with the premise that life is short, so let’s make our choices count. 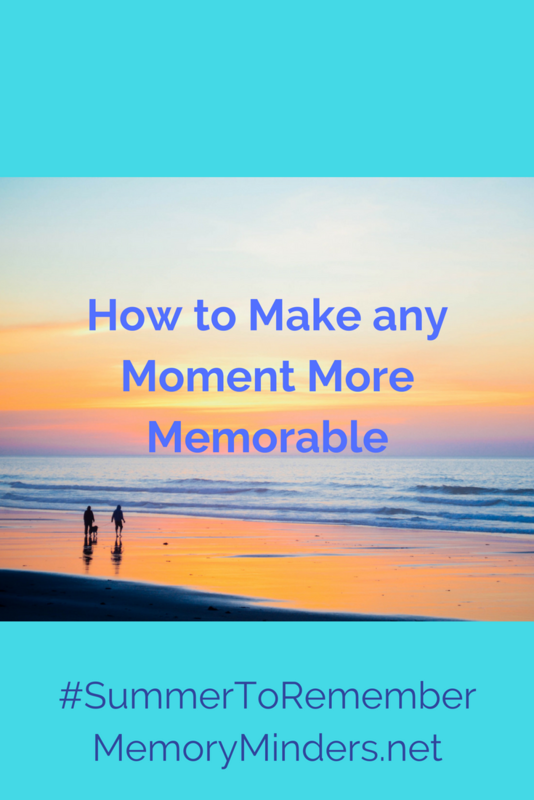 The goal was to create an environment for making memories of all our fleeting moments. I did pretty well-how about you? First off, we discussed how the choices we make reflect what we value while also impacting what and how well we remember. What we choose to think about and how we manage our physical wellness is imperative. Taking care of our bodies and also prioritizing what’s important dictates how well we live and recall our lives. Making healthy choices matter. To that end, we began with some challenges. The first one was to be aware of and hone the skill of focused attention. How we each do this is unique, but the main point is if we don’t or can’t pay attention well, we will never remember anything. It’s just not possible to input information into our memory without paying attention. If we learn and apply this, we’ll remember more. Next was a challenge to identify HOW we individually prefer to remember. This typically stems from how we learn or our learning style-visual, auditory or tactile. We may not all understand how we learn best, but thinking about what we enjoy is a first step in knowing our unique learning style(s). Then we apply memory techniques to coincide with how we learn and bingo-we begin to remember more! Now that we know how to remember more, our challenge focus shifted to keeping our brains healthier. Just like a muscle wants to move, the brain wants to be used. It’s the old ‘use it or lose it’ adage which rings so true. We need to keep learning to keep remembering. Resting on our laurels only allows our brains to atrophy. In order to make it a summer or any moment to remember, we need to keep our brains learning, growing, creating, and maintaining neural connections. This can even be improved upon by stepping out of our comfort zones. Just as we need to keep our brains learning, we need to keep our bodies moving. Exercising our bodies feeds our brains to function better. Remembering well is enhanced by physical exercise and hopefully the 5 tips to encourage more movement benefited you this summer! Remembering well is not just about the what, but also the how. How something feels as well as how we think impacts what we remember. Using our senses to connect memories while having a good attitude about life and all we experience truly strengthens our actual memories. To remember well It’s crucial to manage the three S’s-socialization, sleep and stress. If these aren’t in sync and managed well, our moments can easily turn into ones of lonely, sleepless stress. Often this summer, my sleep habits were varied and I always felt it. Crabby, groggy and foggy could have described me on some days. But managing, adapting, and adjusting my sleep and stress when I could (not always as well as I would have hoped) was beneficial. Being with others can either cause stress or relieve it. Using all the tips given in these posts helped me manage and improve these big three components. We went through a wealth of information in this #SummerToRemember series. It’s my hope you were able to learn but most importantly apply this information to make your own moments memorable. Take these memories and literally and figuratively store them in your memory and/or as something tangible like pictures, a journal or even simply sharing them with others. Our memories make up the fabric of our lives and the patchwork of our identity. As we turn to September, autumn and the seasonal and life changes which will evoke different memories, I’ll be taking a week off to make and share memories with loved ones over Labor Day. Please do the same. Life is short and every moment is meant to be savored. Take some time to enjoy the long weekend and share some memories with others. I’ll be back the following week, ready to encourage us all to even more memorable moments! It sneaks up like a preying lion and suddenly hits. Out of nowhere we bark at our loved ones with short tempers. Or even more subtle, it simmers slowly as we gradually gain weight and/or lose sleep, our thoughts and interest in things we once loved. Stress takes a toll on us physically and mentally and often we aren’t aware until something snaps. We all can quote the physical ramifications of unmanaged stress: high blood pressure, ulcers, heart disease and stroke to name just a few. But often what goes unnoticed is the mental impact of ongoing or acute stress. Sleeplessness leads to memory loss. Worrying and multitasking lead to forgetfulness and indecision. The ramifications of stress on our brain and memory are ongoing and long lasting. When the brain is under stress, it quickly decides what’s important and minimizes the energy given to lesser things. What used to come naturally and easily is suddenly difficult. Deciding what to make for dinner or balancing the checkbook become monumental tasks. It impacts every area of our lives, whether we realize it or not. Find your happy place. This is a reflective exercise we do in our minds when stress invades and threatens to steal our joy. Identify a place, real or imagined, where you are entirely comfortable and happy. Then, when feeling stress rise, go there on a mind mini-vacation! Imagine how it feels there, take a deep breath and be enveloped in warmth, happiness and love. It can literally lower blood pressure, heart rate and take our minds off the stressful situation we are experiencing. Try it-it works! Breathe. Most any situation can accommodate a few seconds for a deep breath (or two or three). This gives us a moment to deliver additional oxygen to our brains, think more clearly and make good decisions. It’s so easy to react or speak in the immediacy of a stressful moment, but those aren’t always our best decisions. Instead, take a few seconds to breathe, think, decide and then speak or act. Pray. Often when taking those deep breaths, I’m silently praying as well. It helps me to let go of the stress, remember what’s most important in each situation, and draw upon inner strength. Try these techniques and see if managing and balancing the stresses of life help you remember more. Summer can be a time when we don’t think as much about stress. But just like that preying lion, it can sneak up and hit us or simmer below the surface before boiling over. 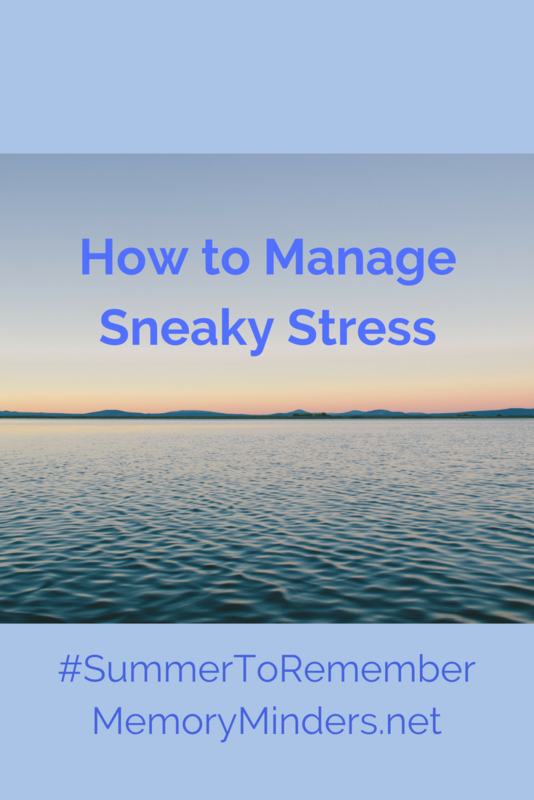 Let’s manage stresses as they come and we’ll make even more memorable moments this #SummerToRemember.